Campsite Erden is a campsite with 70 touring pitches and 69 year round pitches. During low season, between 06-04-2019 - 05-07-2019, 04-09-2019 - 27-09-2019 and 08-10-2019 - 02-11-2019, the nightly rate is €20,- at one of the 70 touring pitches at Campsite Erden in Erden (Rhineland-Palatinate). At this campsite you can not only use your CampingCard ACSI for inexpensive camping, you can also use your ACSI Club ID (as an alternative ID). The campsite for top wines! Situated directly on the Moselle and the Moselradweg cycle path. Peace, space and enjoyment. Good check in with Lady who spoke English and provided all details. Offered long cable if ours was too short. Set up electric ACSI price includes 4 kw then charged per KHW. Site bar pleasant seem to pick up passing trade. Did not try food but looked OK. Very short walk into village which had a couple of restaurants and bars. Some wineries also. Nice site on side of the river. Free WiFi. Does not accept credit cards. We stayed for 8 nights in June. Very good well run site, clean and good pitches, we had a riverside pitch with views over the hillside vine yards, so paid a supplement which was well worth it. Nice friendly staff, good bar and food. We will be back next year for a longer stay. This is a most beautiful location. The staff are friendly but do forget to tell you everything when checking in. We did not know a card was required in order to use shower until too late. Food & drink available until 8pm but super restaurants in the village. Will definitely go back due to sheer beauty of location. Campsite by the Mosel River, right on the Mosel cycle path. We had a long ride in each direction, to Zell and to Piesport. Many villages were celebrating the Wine Harvest and the site was busy for late September. The facilities are good and the ACSI card rate included showers, though (unknown to us) only 4 kwh of electricity per day, any excess being metered. The owner insisted she had explained this, but that was not the case. Riverside pitches charge extra money (which was only divulged after we'd chosen a place, so we changed!). The camping field is sloping and undivided, with access difficult in wet weather. There is also a cheaper motorhome park adjoining the site that shares the facilities. WiFi was available free of charge around the reception/restaurant area only. The restaurant served the usual fare (Schnitzel, chips and salad) freshly cooked and at a reasonable price. Bread etc was on sale in the mornings. Very friendly welcome by staff who speak good English and tolerated my school-girl German. The site is directly on the banks of the Mosel and we asked if we could pitch next to the river. We were informed these were for camping and we were directed to an area at the back of the site which appeared to be just for motorhomes. Perhaps this is to reduce traffic on and off the grassed areas which is perfectly understandable as we were only there for one night. Very clean showers and toilets, with seats and toilet paper. Cycle track just over the road. Easy ride into Rachtig where there was a wine festival. We ate at the Deutschherrenhof which was reasonably priced. We have stayed at this campsite twice. The site is nice and well positioned for visiting the area. However, on both occasions we have had problems with positioning our campervan and awning. Last year we were directed to the camping area and told where to pitch. The pitches were not marked out and we started to unpack where indicated only to be told to move a couple of metres as we were blocking the track between pitches. As there was nothing else there this was difficult to judge. This year we booked in with our ACSI card, were given a pitch, unpacked and erected our awning. The man who checked us in watched this happening. The lady owner then came and told us we were in the wrong place and our awning was too large. She also said that it was not an ACSI pitch. As we had booked in with our card this was a surprise. The moral is be very careful where you pitch and before unpacking/putting up awnings etc get the owners to confirm that you are in exactly the place they want you. you didn´t stand on the camping area. You wanted to stay on the cheaper Mobilhomeplace. An there you have only the place for the car. My wife and I booked in for one night and stayed five. 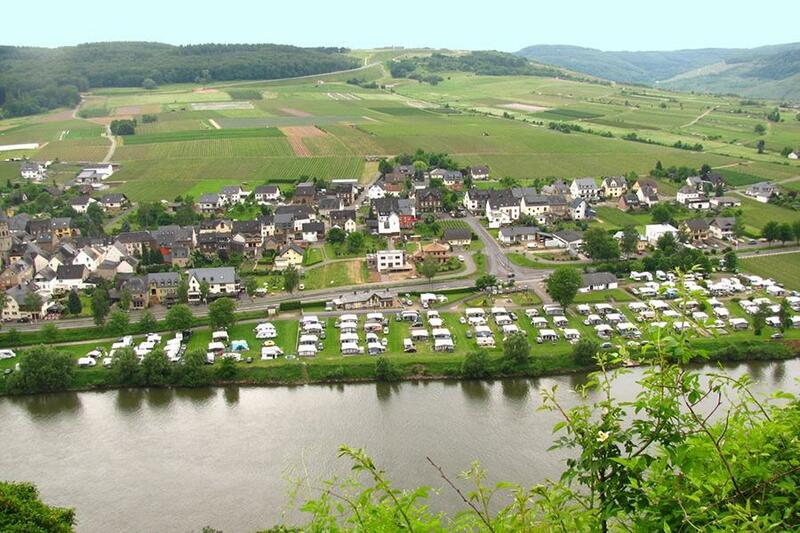 The Mosel is a very beautiful area and this site being right in the middle makes it an ideal location. The facilities on site were very clean and very well maintained. The owners were very friendly and helpful and nothing seemed to be too much trouble, an example being we moved pitch during our stay to one right on the river bank, and because our mains cable wasn't long enough we were loaned one free of charge, with a smile and a 'no problem'. We've stayed on a few sites on the Mosel over the years and we'll definitely be back to this one. Would you like to book Campsite Erden or request more information? You can do both using the information below or by visiting the campsite's website. A1 exit Wittlich direction Bernkastel Kues. In Zeltingen cross bridge towards Traben-Trarbach. CampingCard ACSI will send your information request to "Campsite Erden".